The Siamese Fireback, Lophura diardi - also known as Diard's Fireback - is a southeast Asian endemic and can be found in the lowland forests of Cambodia, Laos, Eastern Thailand and north to Vietnam. Their preferred habitat includes very dense evergreen, semi-evergreen and bamboo forest areas, secondary growth and scrub in the plains and foothills up to 2,600 feet (800 m). Males are usually found in the company of two or three females or in small groups which are presumed to be family parties. Due to ongoing habitat loss and hunting in some areas, the Siamese Fireback is evaluated as Near Threatened on the IUCN Red List of Threatened Species. The Siamese Fireback is the national bird of Thailand. As the only bird named for the nation, it is fitting that Siamese Fireback has made it onto the top ten most wanted species of Thailand. The scientific name commemorates the French naturalist Pierre-Médard Diard. The male Siamese Fireback is a magnificent bird and easily identified. They attain their adult plumage the first year. This medium-sized pheasant can grow up to 31 inches (80cm) in length. 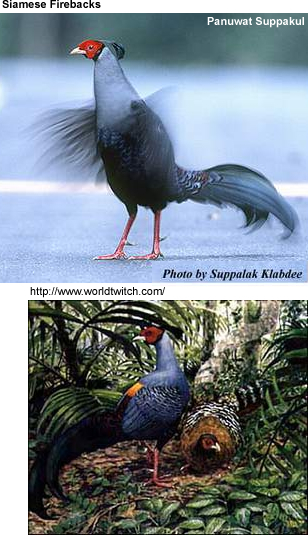 Males: The striking male Siamese fireback is most notable for its unusually long crest of purple-black feathers, which reaches up to 3.5 inches (9 cm) in length and becomes erect when the bird is excited. The facial wattles are bright red, the throat, head and face behind the wattles are black. The breast, neck and upper back is gray with very fine vermiculations (= a pattern of fine, wavy, worm-like lines or streaks of color). The middle of the back is bright yellow (hence the name "fireback"), the lower back is metallic blue with chestnut fringes. The tail is long and curved with metallic black, blue and green sheens. The wings are gray with black and white streaks; the belly and lower areas are black. The bill is yellow, legs and feet red. Female: Even though the females are not colorful, their unique markings make them more attractive than other pheasant hens. The Siamese Fireback hen has no crest, her facial wattles are smaller than the male's, but just as bright. The head, throat, chin and neck are grayish-brown; the upper back and upper breast are bright chestnut. The lower back, wings and tail are chestnut, vermiculated with white and black. The bill is dark gray and the legs and feet are red. 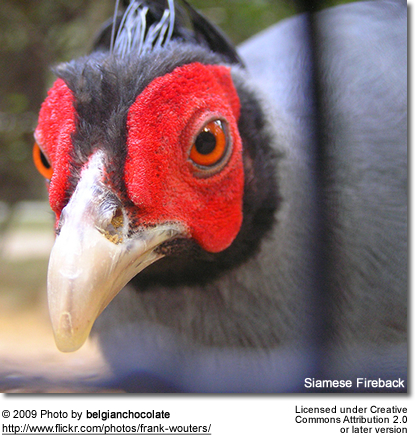 The Siamese Fireback is readily available in America and is fairly common in aviculture. Males are fertile in their third year; however, some males are said to have been able to produce in their second year. Males will attain adult plumage the first year, but will have smaller tails than mature birds. Males can grow fairly long spurs that the keeper will need to keep trimmed to prevent injuries to the hen when breeding. These pheasants prefer a large planted aviary with lots of shade. Siamese Fireback will require good shelter with perhaps a little heat during the colder months. More information on housing these pheasants. Their breeding season starts in May and continues until July. The female lays up 5 to 8 eggs a clutch, which she incubates for 24 to 25 days. It is advised to provide the chicks with plenty of green food and mealworms during brooding. More information on breeding and caring for these pheasants.